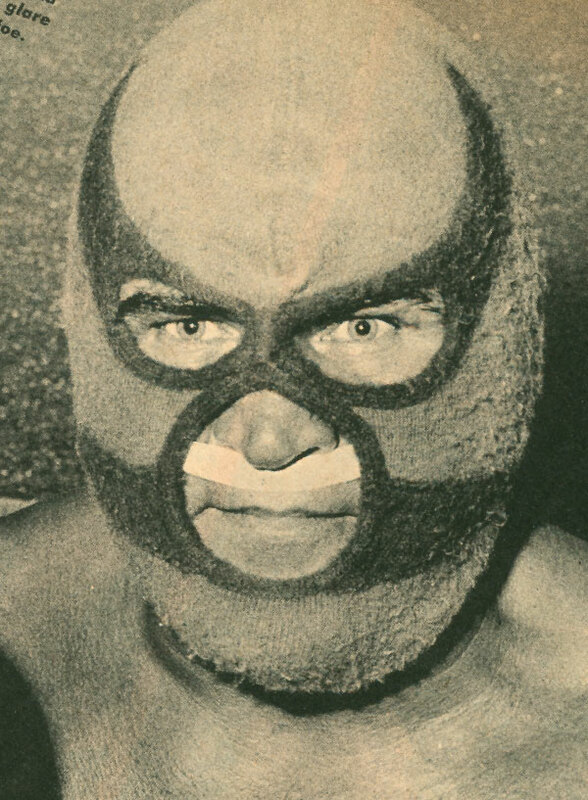 I love the early wrestling masks, before the 4-panel design became pretty much the standard construction everywhere. 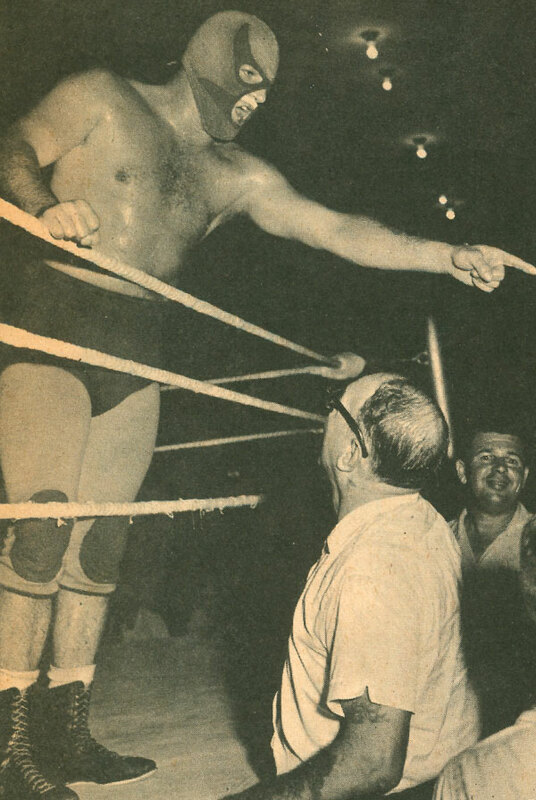 This really nice shot of 60s masked standouts The Bolos, who were various wrestlers under even more various incarnations of the name depending on when and where in the southern U.S. you saw them) shows some evolution and innovation in the mask both in material and design. The hoods are in the Destroyer-type vein, with the single large opening for the mouth and nose. The white strip added for stability under the nose was, I’d guess, the result of a few hard lessons learned in the ring when one of the heels found himself breathing out an eyehole while blind-folded by his own shifted mask. I have to think this strip really cut into the face, regardless of what it was made of. I’m also fascinated endlessly by the materials of these early hoods. Some were women’s underwear, some wool, goat skin and other less-than desirable face coverings. These look like heavy jersey material, and showing all sorts of wear. 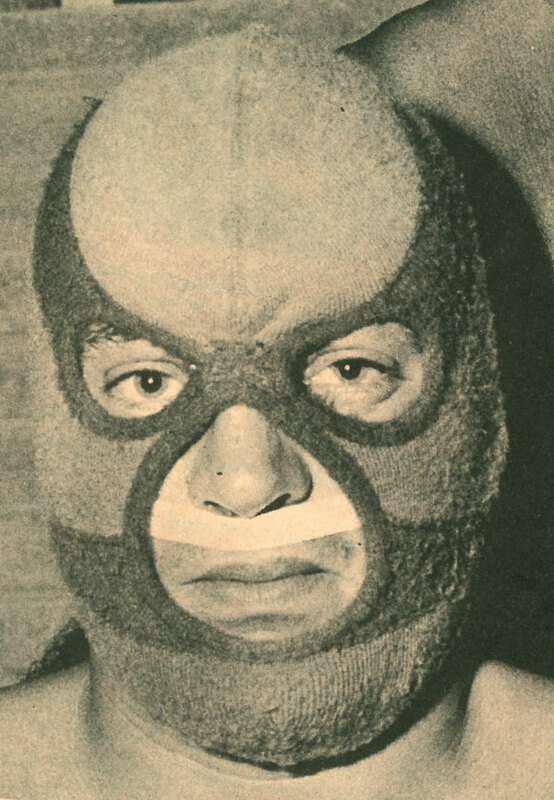 Can’t imagine what a Texas or Florida arena was like in the summer when you had to wrestle in what was basically a thermal ski mask. What were the pioneering mask mutations of the 50s lasted somewhat into the 60s, but by the latter part of the decade the modern 4-panel/lace back pattern perfected in Mexico was being copied all over the world. And for good reason, they really got it right, and the design was functional and safer for the performers wearing them. Materials got better and better, too. No more non-breathing or heavy heat-retaining fabrics. You really have to hand it to the guys who suffered with these early forms of the wrestling mask.